Zioga P. & Jackson R. (2016) The open-source Eye-Gaze Tracking System. ©2016 Zioga P., Jackson R. & DCA. 'Re-mark' is a research project realised in Dundee Contemporary Arts Print Studio, exploring how artists with disabilities can access interactive technologies that can limit the need for human intermediaries in their fine art practice. 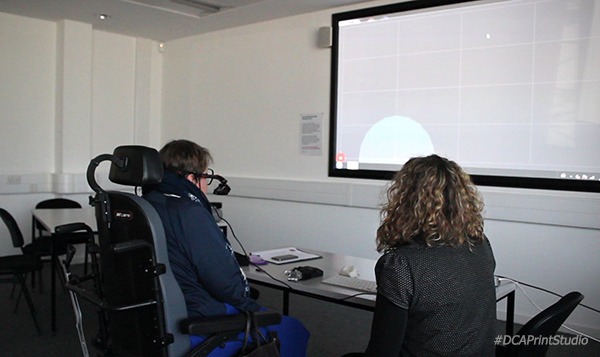 The aim is to investigate and improve the use of open-source Eye-Gaze Tracking Systems (EGTS) by print artists with Multiple Sclerosis (MS). Multiple Sclerosis (MS) is a condition that can affect the brain and/or spinal cord and potentially cause a wide range of symptoms, such as problems with vision, arm or leg movement, sensation or balance. It is estimated that in UK there are more than 100,000 people diagnosed with MS (source NHS). Eye-Gaze Tracking Systems (EGTS) are hardware and software that can track the movement of the eye's pupil, which then can be used in order to control computer-based applications. Recent developments have introduced low-cost and open-source hardware and software aimed to help disabled artists to re-engage with their creative practice. However, the use of EGTS by print artists with MS presents special challenges and opportunities that have not been investigated so far sufficiently. 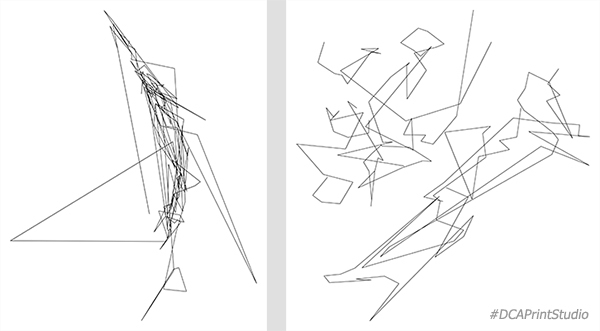 Anonymous artists & Zioga P. (2016) Eye-Gaze Tracking drawings. ©2016 Zioga P. & DCA. The project is awarded and funded by the Scottish Graduate School for Arts & Humanities (SGSAH) as part of a Doctoral Internship scheme in collaboration with the Glasgow School of Art (GSA). It is based on the Eye Can Draw (ECD) project that was previously developed at Dundee Contemporary Arts (DCA) and jointly funded by Creative Scotland. - sufficient data that can lead to future development. Moreover, in the immediate future we will release an experimental short animation film and we will publish the results of the evaluation and the co-design process. Zioga P. (2016) 'Re-mark.' Workshop with a participant artist. ©2016 Zioga P. & DCA. 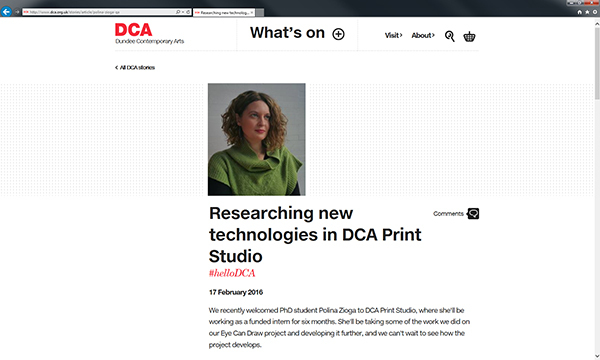 - DCA Dundee Contemporary Arts (2016): Researching new technologies in DCA Print Studio [Online interview with Polina Zioga]. 17 February 2016. - Jackson R. (2013): Human-computer interaction: Exploring eye-tracking as a drawing methodology for print artists with disabilities. In: Impact 8 International Printmaking Conference, 23 August – 1 September 2013, Dundee, UK. The DCA Print Studio is internationally renowned for the open-access fine art printmaking facilities and activities, but also for the available contemporary digital technologies, which promote the access for artists with disabilities. SGSAH was established in 2014 to identify, develop and share world-class collaborative training for doctoral researchers in the arts & humanities at Scottish universities. With 16 member higher education institutions and more than 40 supporter organisations from the public, private and third sectors, SGSAH come together to inspire researchers who are capable, caring, ethical & reflective professionals who can make a difference in the world through their work. The Glasgow School of Art is internationally recognised as one of Europe's leading university-level institutions for the visual creative disciplines. The studio-based approach to research and teaching, brings disciplines together to explore problems in new ways to find new innovative solutions. The studio creates the environment for inter-disciplinarity, peer learning, critical enquiry, experimentation and prototyping, helping to address many of the grand challenges confronting society and contemporary business. Special thank you: Dr. Alison Hay, Prof. Frank Pollick and Prof. Jon Rogers.